Product #17396 | SKU RMB170 | 0.0 (no ratings yet) Thanks for your rating! 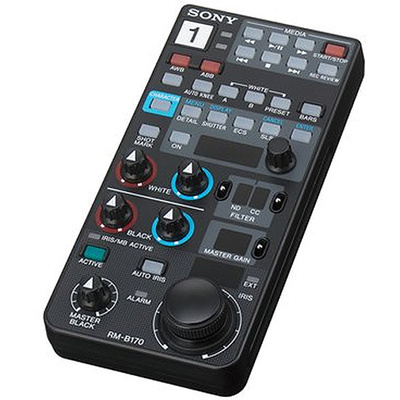 The Sony RMB-170 Handheld Remote Control Unit is designed for use with the PMW-500, PMW-320, PMW-350, PMW-F3, PDW-700, PDW-F800, BVP-950A, BVP-750A, BVP-570, BVP-550, HDW-700A, HDW-F900, and DSR-450WSL Camcorders. This unit utilises the new studio camera command system and can be used in place of the RCP-700 series Remote Control Panels. When used with the supplied 10 m interconnect remote cable, a monitor output for a picture monitor is provided on the RMB-170 Unit (for all camcorders except the HD units).